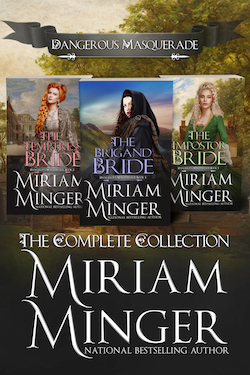 Enjoy three of award-winning author Miriam Minger’s 18th Century historical romances in one dangerously exciting collection: The Brigand Bride, The Temptress Bride, and The Impostor Bride! When Maddie Fraser’s father was killed fighting for Bonnie Prince Charles, she swore to avenge his death. Hooded and disguised, she led a series of daring raids against the forces of the Crown—vowing to love no man until the English invaders were driven from her beloved Scottish Highlands. Stefan nearly shouted in triumph. He’d searched throughout Vienna for the beguiling tavern wench who had aroused him past endurance, and here she stood like a shimmering goddess…no tavern wench but a lady of the Imperial court. He must have her–he would have her!—if only to safeguard her honor by making her his wife.